Introducing and implementing an EBR system requires systematic analysis, definition and assessment of the regulatory requirements, process-based data and product-relevant information. Electronic Batch Recording for Drugmakers gives you the necessary tools and knowledge for a successful introduction and implementation. Data management system concepts for electronic batch recording (EBR) can optimise processes and render them more efficient. Process risks can be reduced preventively and the observance of legal requirements is ensured right up to supporting the pharmaceutical quality system. 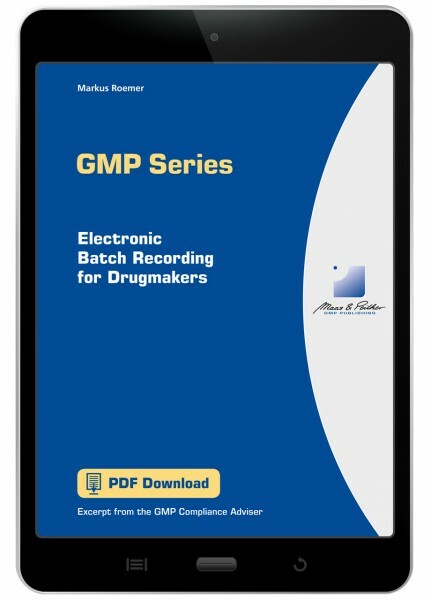 EBR systems create relevant documents and records pursuant to the EU-GMP Guide Chapter 4 and they implement the release and certification of batches in accordance with Annex 16. For this purpose, Annex 11 refers to special chapters for electronic batch certification and release.